The previous studies of p16INK4a, pRb, p53, and Ki-67 expression suggested that these markers may be preferentially expressed in cervical neoplasms. The purpose of this study was to assess the expression and the clinical significance of p16INK4a, pRb, p53, and Ki-67 proteins in cervical lesions. We obtained 106 cases with various categories of cervical squamous mucosa, including squamous cell carcinoma (n=35), cervical intraepithelial neoplasia (CIN) II/III (n=26), CIN I (n=10), squamous metaplasia (n=15), and normal squamous mucosa (n=20). Immunohistochemical staining was performed for p16INK4a, pRb, p53, and Ki-67 proteins in formalin-fixed and paraffin-embedded tissue sections of the uterine cervix. Evaluation of immunohistochemical staining was based on the frequencies of expression and the mean immunoreactivity scores (IS) in each diagnostic category. p16INK4a positive sotaining was observed in 26 of 35 cases (74.3%) of squamous cell carcinoma, in 16 of 26 cases (61.5%) of CIN II/III, in six of 10 cases (60%) of CIN I, in nine of 15 cases (60%) of squamous metaplasia, and negative in normal squamous mucosa. pRb expression was detected in all diagnostic categories; however, the proportion of pRb positive cells was relatively decreased in CIN II/III (38.5%) and squamous cell carcinomas (51.4%), compared to normal squamous epithelium (90%) and squamous metaplasia (73.3%). No significant differences in expression of p53 were observed in any diagnostic categories. Ki-67 expression was increased in squamous cell carcinoma (37.1%), CIN II/III (42.3%), and CIN I (40%), but negative in squamous metaplasia and normal mucosa. In 35 cases of squamous cell carcinomas, multivariate analysis revealed no differences in pINK4a, pRb, p53, and Ki-67 expression according to the age of the patient, lymph node metastasis and clinical stage. In conclusion, the combined use of p16INK4a and Ki-67 immunoreactivity could improve the diagnostic specificity of squamous cell carcinoma of the uterine cervix. Carcinoma of the uterine cervix represents the fourth leading cause of cancer death in female worldwide. Although routine Papanicolaou smear screening programs have steadily reduced the mortality rate of cervical carcinoma since the 1940s, there continues to be an under-screened in high-risk population, and approximately 275,100 women worldwide still die from their disease each year [1-3]. According to 2002 Annual Report of the Korea Central Cancer Registry, uterine cervix cancer forms 9.1% of all cancers in Korean women and it ranks fifth preceded by breast cancer, stomach cancer, colon cancer and thyroid cancer, in Korea . Squamous cell carcinoma accounts for 75 to 85% of cervical cancers  and develops in the background of increasing grades of dysplasia (termed cervical intraepithelial neoplasia, CIN) [5, 6]. The cell cycle machinery is controlled by external signals such as growth factors and antimitogens. Progression of cells through the G1 phase and the G1-S transition involves sequential assembly and activation of key regulators of the cell cycle machinery, the cyclin dependent kinases (CDKs). Normal cells have developed an intricate system of safeguards, checkpoints, mainly mediated by p53 and pRb, which provide a quality control function by constantly surveying the ordered progression through the cell division cycle . Cervical cancer is one of the best-understood examples of how viral infection can lead to malignancy. Infection with high-risk HPV types interferes with the function of cell proteins and also with the expression of cellular gene products. The p16INK4a protein (p16INK4a) is a cyclin-dependent kinase (CDK) inhibitor that decelerates the cell cycle by inactivating the CDKs that phosphorylate retinoblastoma (Rb) protein and is known to play a critical role as a negative regulator of cell cycle progression. The p16INK4a /cyclin D1/CDK4/pRb cell cycle regulatory pathway plays central role in regulation of the G1-to-S phase transition. Passage through the restriction point (late in G1) and progression toward the S phase appear to be controlled by the G1 cyclins and their CDKs. CDKs are inactive as monomers and become active only after binding to a cyclin partner to form cyclin-CDK complexes whose function is to phosphorylate RB protein. Consequent conformational change resulting from Rb hyperphosphorylation in late G1 phase disrupts its association with various E2F family members and enhance the release of E2F from the pRb, allowing the coordinated transcription of a bank of genes whose activities are necessary for DNA synthesis. In the case of HPV-positive cervical cancer, an overexpression of p16INK4a is demonstrated as a result of functional inactivation of pRb by the HPV E7 protein. Due to the overexpression of p16INK4a, it could be used as a marker for cervical intraepithelial lesions and cervical cancer was suggested [7-11]. Furthermore, conjunctive p16INK4a immunohistochemical stain in CIN lesions may also be used to correct the subjective grade assessed by non-expert pathologists, as CIN grading may not always be reproducible [12, 13]. In mammalian cells, the p53 protein participates in several checkpoint control mechanisms . In the presence of DNA damage, The p53 protein acts as a transcriptional activator, and increased levels of this protein result in enhanced transcription of p53-responsive genes including the gene encoding the CDK inhibitor p21 [8, 15, 16]. This protein can inhibit multiple cyclin/CDK complexes, including those that phosphorylate and regulate the activity of pRb. The monoclonal antibody Ki-67, also known as MIB 1, (directed against the nuclear proliferation-associated antigen Ki-67) is a murine monoclonal antibody that recognizes a nuclear protein involved in the DNA replicase complex. It is generally accepted that expression of Ki-67 is an excellent indicator of tumor proliferation . 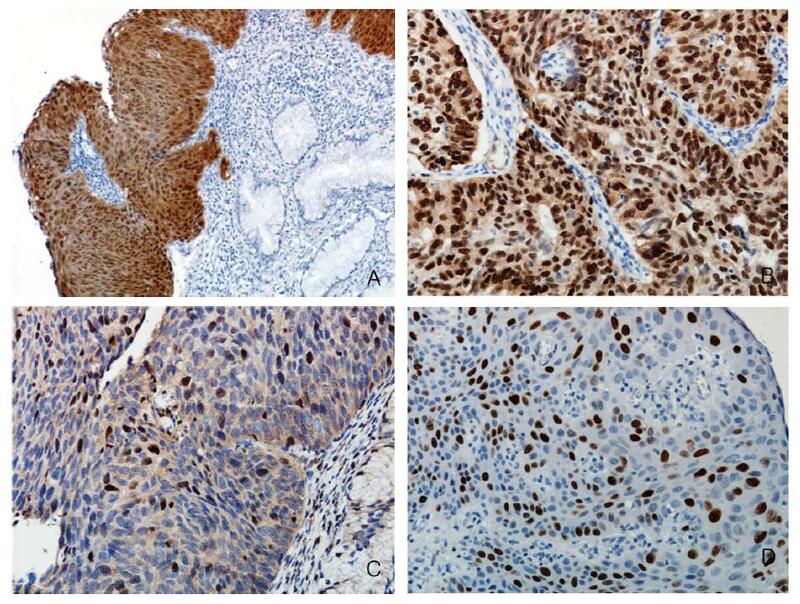 In uterine cervical neoplasia, Ki-67 proliferation index correlates with an increased propensity of tumor progression, therefore immunohistochemical staining of Ki-67 is known to be useful in the distinction of different CIN grades and could be used as a quality control method against the subjective CIN grading in daily practice [18-24]. Ki-67 staining also acts as an objective parameter to improve intra- and inter-observer reproducibility [22, 24]. In order to determine whether those proteins can be a specific marker of premalignant and malignant lesions of the cervical squamous mucosa and to search for the feasibility of using p16INK4a, pRb, p53 and Ki-67 immunohistochemical staining patterns as an ancillary technique to identify significant premalignant and malignant cervical lesions, present study tried to assess the expression of those proteins in cervical squamous mucosa and to determine whether there is any correlation between the expression of p16INK4a and that of pRb, p53, and Ki-67 at the tissue level. And to know whether the clinicopathologic features of those proteins in cervical squamous cell carcinoma, this study assessed the expression of p16INK4a, pRb, p53, and Ki-67 according to the parameters such as the age of the patients, lymph node metastasis and the clinical stage. One hundred and six uterine cervix specimens were randomly selected from the surgical pathology files of Chungbuk National University Hospital. The histologic diagnoses of the specimens were as follows: 35 cases of squamous cell carcinoma, 26 cases of CIN II/III, 10 cases of CIN I, 15 cases of squamous metaplasia, and 20 cases of normal squamous mucosa. In addition, to correlate the immunohistochemical findings with the clinicopathological parameters in 35 cases of squamous cell carcinoma, the pathologic slides were reviewed, including the histologic grading, the depth of invasion, and the presence of nodal metastasis. Of those cases, 25 cases were classified as stage 1, 2 cases are as stage 2, and 8 cases are as stage 3 carcinomas. TNM staging according to the staging system of the American Joint Committee on Cancer (AJCC) was used . All archival materials were routinely fixed in 10% neutral-buffered formalin, and embedded in paraffin. 4-μm sections were prepared on silane-coated slides (Sigma, St Louis, MO, USA). Tissue sections in slides were deparaffinized with xylene, hydrated in serially diluted alcohol, and the sections were then immersed in 3% H2O2 to quench the endogenous peroxidase activity. The sections were then microwaved in 10 mM sodium citrate (pH 6.0) for 15 min for antigen retrieval. And then, the sections were incubated with primary antibody p16INK4a (clone E6H4; DaKo, Germany; dilution, 1:30), pRb (clone 1F8; NoVo, United Kingdom, dilution, 1:50), p53 (clone DO7; NoVo, United Kingdom, dilution, 1:50) and Ki-67 (clone ; MM1, NoVo, United Kingdom, dilution, 1:100) for 60 min, and after three successive rinsing with washing buffer, further incubated with biotinylated goat anti-mouse Abs (DiNonA, Korea) for 20 min. After rinsing, the tissue sections were incubated with the HRP-conjugated streptavidin (DiNonA) for 20 min at room temperature. The slides were washed and the chromogen was developed for 5 min with liquid 3,3’-diaminobenzidine (DiNonA). The slides were then counter-stained with Meyer’s hematoxylin, dehydrated, and mounted with Canada balsam for examination. Negative control consisted of substitutions of buffer in place of the primary antibody. For the proper comparison of the antigen expression in the different samples, the evaluation of the immunohistochemical staining for p16INK4a, pRb, p53, and Ki-67 was based on the frequency of expression and the intensity of the staining (immunoreactivity score: IS) in each diagnostic category. The scoring method of Sinicrope et al. was applied to evaluate both the proportion of stained epithelial cells and the intensity of the immunohistochemical staining. Membranous staining was independently considered. The proportion of the positive cells was assessed semiquantitatively as the percentage of the total number of epithelial cells and graded as one of five categories:<5%, 0; 5-25%, 1; 26-50%, 2; 51-75%, 3; and >75%, 4. For p16INK4a, p53 and pRb, cases with the proportion of more than 5% positive cells were defined as positive. On the other hand, for Ki-67, cases with the proportion of more than 20% positive cells of moderate intensity defined as positive. The intensity of staining was subjectively assessed and graded as: weak, 1; moderate, 2; and strong, 3. For the proper comparison, the grade of positivity of tumor cells and that of the intensity of staining were multiplied to produce a immunoreactivity score (IS) for each tumor specimen. Each sample was examined and scored separately by two pathologists, and cases with discrepant scores were discussed until unity was achieved. Statistical analyses were performed using the Fisher’s exact test, Pearson’s χ2 test, Mann-Whitney test, Kruskal-Wallis test, and Turkey HSD, Duncan test as post hoc test, Kaplan-Meier method. For the comparison of means of IS, the Mann-Whitney test, Kruskal-Wallis test, Turkey HSD, and Duncan test were used. The association of the expression rate with clinicopathological factors was assessed by cross-tabulation, and the significance of differences was determined by the Fisher’s exact test and Pearson’s χ2 test. p-value of less than 0.05 was regarded as statistically significant. All statistical analyses were performed using SPSS software. (SPSS, Chicago, USA). p16INK4a staining was localized to both the nucleus and the cytoplasm of epithelial cells in all positive cases. Stromal cells, endothelial cells, and acute and chronic inflammatory cells were consistently negative but scattered stromal histiocytes were sometimes strongly positive for p16INK4a. pRb, p53 and Ki-67 expression were detected only in the nucleus of squamous and glandular epithelial cells (Fig. 1, Fig. 2). Fig. 1. Immunohistochemical staining for p16INK4a in squamous mucosa. (A) Strong and diffuse nuclear and cytoplasmic p16INK4a staining of squamous cell carcinoma. (B) Strong and diffuse nuclear and cytoplasmic p16INK4a staining of and CIN III. (C) Moderate and focal p16INK4a expression in CIN I. (D) Normal squamous epithelium is completely negative for p16INK4a expression. Fig. 2. 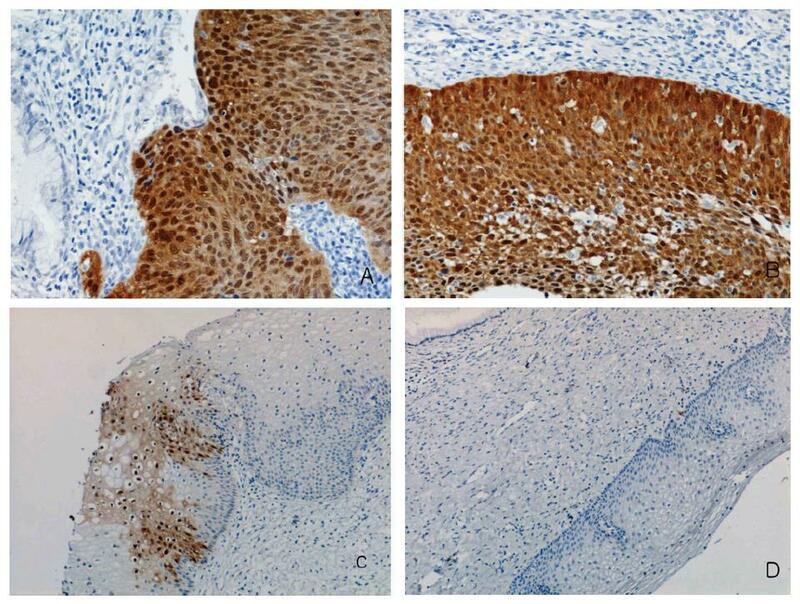 Immunohistochemical staining for (A) p16INK4a, (B) p53, (C) pRb, and (D) Ki-67 in cervical squamous cell carcinoma. The expression of p16INK4a was detected in 26 of 35 cases (74.3%) of squamous cell carcinoma and 16 of 26 cases (61.5%) of CIN II/III. In those diagnostic categories, the strong nuclear and cytoplasmic staining was observed (Fig. 1A, 1B). The expression of p16INK4a was detected in 6 of 10 (60%) of CIN I lesions; the staining was most intense in lower layers of epithelium and usually less in the upper layer of the epithelium (Fig. 1C). The expression of p16INK4a was generally not detected in normal squamous epithelium (Fig. 1D) and was detected in only in 1 of 20 cases (5%) of normal squamous epithelium. However, focal p16INK4a staining of metaplastic squamous epithelium was noted in 9 of 15 cases (60%) (Table 1). The mean IS was 4.74 in squamous cell carcinoma, 3.58 in CIN II/III, 3.00 in CIN I, 2.67 in squamous metaplasia, and 0.20 in normal squamous epithelium (Table 2). In general, p16INK4a immunohistochemical staining showed the pattern that both frequency of the expression and the IS were increased with the increasing grade of worse differentiation of the squamous epithelial cells. The differences were statistically very significant in both frequency of the expression and immunoreactivity score (IS) of the staining (both, P<0.001) (Table 1, 2). The expression of p16INK4a was higher in older (>55 years) patient than younger, but there were no differences at all in the expression of p16INK4a according to lymph node metastasis and the stage of the carcinoma (Table 3, 4). The expression of pRb was detected in 18 of 35 (51.4%) cases of squamous cell carcinoma, 10 of 26 (38.5%) cases in CIN II/III, 6 of 10 (60%) cases CIN I, 11 of 15 (73.3%) cases in squamous metaplasia, and 18 of 20 (90%) cases in normal squamous epithelium. In the latter two diagnostic categories, staining was restricted to the parabasal and low-intermediate cell layers. The basal cell layer was negative for pRb expression in most cases. (Table 1). The mean IS was 1.80 in squamous cell carcinoma, 1.23 in CIN II/III, 1.33 in CIN I, on the other hand, it was 3.20 in squamous metaplasia and 3.30 in normal squamous epithelium (Table 2). In contrast to p16INK4a, the expression of pRb in immunohistochemical staining showed the general pattern that both frequency of the expression and IS of the staining were decreased with the increasing grade of worse differentiation of the squamous epithelial cells. And the differences were statistically significant in both expression and IS of the staining (both, P<0.05) (Table 1, 2). There were no differences in the expression of pRb in squamous cell carcinoma according to all the clinicopathological parameters, such as the age of the patient, lymph node metastasis, and the stage of the carcinoma (Table 3, 4). The expression of p53 was detected in 24 of 35 (68.6%) cases of squamous cell carcinoma, in 20 of 26 (76.9%) cases of CIN II/III, in 5 of 10 (50%) cases of CIN I, in 11 of 15 (73.3%) cases of squamous metaplasia, and in 14 of 20 (70%) cases of normal squamous epithelium (Table 1). The mean IS was 2.71 in squamous cell carcinoma, 2.54 in CIN II/III, 2.00 in CIN I, 2.40 in squamous metaplasia, and 2.40 in normal squamous epithelium (Table 2). Both frequency of the expression and the mean immunoreactivity score (IS) were not statistically significant. (Table 1, 2). And there was no difference in the expression for p53 in squamous cell carcinoma according to clinocopathologic parameters. Ki-67 was focally expressed in normal basal layer of squamous cell epithelium. The frequency of the expression of Ki-67 was significantly higher in premalignant/ malignant lesions; squamous cell carcinoma (37.1%), CIN II/III (42.3%), and CIN I (40%) than in benign mucosa; squamous metaplasia (6.7%) and normal squamous epithelium (10%) (P<0.05) (Table 1). The mean immunoreactivity score (IS) showed strikingly different contrast between premalignant/malignant lesions and benign mucosa. It was 2.46 in squamous cell carcinoma, 2.38 in CIN II/III, 4.67 in CIN I, on the other hand, 0.27 in squamous metaplasia, 0.4 in normal squamous epithelium (Table 2). There was no difference in the expression for Ki-67 in squamous cell carcinoma according to clinocopathologic parameters. This study evaluated the expression of p16INK4a, pRb, p53, and Ki-67 in normal, premalignant and malignant tissues of the squamous mucosa and demonstrated that combined use of p16INK4a and Ki-67 improved the diagnostic specificity of squamous cell carcinoma of uterine cervix. It has been repeatedly shown that there is a substantial lack of interobserver reproducibility in the histologic diagnosis of cervical intraepithelial neoplasia (CIN), which might be improved by a more specific diagnostic biomarker [12, 13]. In a study conducted by Lanbert et al., marked overexpression of p16INK4a protein was observed in all cervical cancers and preneoplastic lesions with infection by high risk HPVs. They also revealed that good correlation was observed between the grade of cervical lesion and p16INK4aexpression, therefore p16INK4a expression would be a good marker for cervical dysplastic lesions and cancer . Galgano et al. also reported p16INK4a staining in a strong and diffuse block pattern is highly sensitive for CIN3+ and CIN2+ but not CIN1. Thus, p16INK4a immunohistochemical staining is useful in distinguishing high-grade CIN from ≤CIN1 and newly trained or relatively inexperienced practitioners can rely on adjunctive p16INK4a staining for the differential diagnosis of confounding lesions like repair process or immature squamous metaplasia . The observation in this study that p16INK4a is highly expressed in CINII/III and squamous cell carcinoma and expressed lower in benign mucosa (P<0.001) is consistent with previous findings indicating that p16INK4a is a sensitive and specific marker for squamous neoplasia of the cervical mucosa [8, 9, 13]. Because p16INK4a is widely expressed in both premalignant and malignant lesions of the squamous cervical mucosa, immunohistochemical staining for p16IINK4a may provide an objective basis for the detection of CIN or carcinoma in equivocal cases. But in this study, even though the mean IS was lower than that of premalignant and malignant lesions, the frequency of p16INK4a expression in squamous metaplasia was 60% that is unexpectedly high (Table 1). This finding raise an issue that p16INK4a alone may be not so sufficiently specific to differentiate squamous metaplasia from CIN. Tringler et al. reported that pRb expression was detected in each diagnostic category; however, the proportion of pRb-positive cells was relatively decreased in high-grade premalignant and malignant lesions of the squamous and endocervical mucosa and showed a generally inverse correlation with the expression of p16INK4a at the tissue . Nam et al. also repoted that the expression of pRb decreased with an advanced CIN grade, and inverse correlation between p16INK4a and pRb levels, resulting from inactivation of pRb by HPV-E7 and a reciprocal overexpression of p16INK4a . 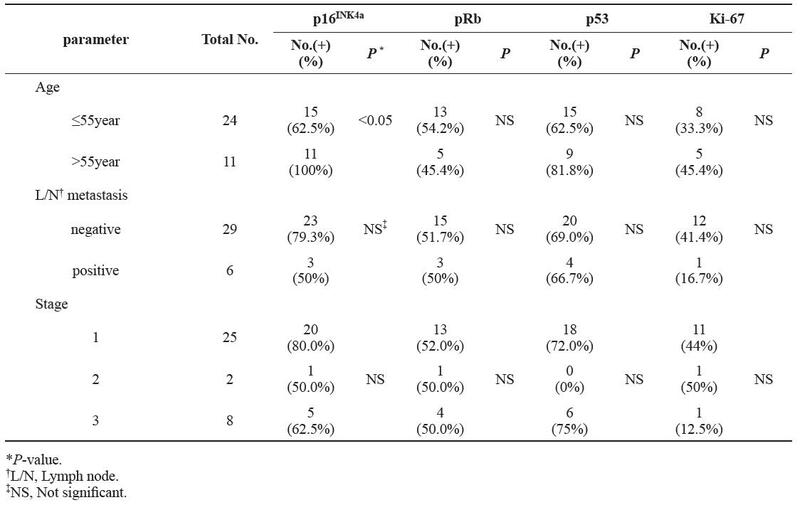 The present study also showed inverse correlation of the pRb expression with the p16INK4a expression; the pattern of relative high expression of pRb in benign cervical mucosa and relative low expression in premalignant and malignant lesions (Table 1). Thus, pRb is not a specific marker for premalignant and malignant lesions of the squamous mucosa. Unlike in many other cancers, the p53 in cervical cancer is usually wild type and is not mutated . The HPV E6 gene product binds to p53 and targets it for rapid degradation via a cellular ubiquitin ligase [29, 30]. As a consequence, the normal activities of p53 which govern G1 arrest, apoptosis, and DNA repair are abrogated . The identification of p53 nuclear overexpression by immunohistochemical staining has been reported to correlate well with p53 mutations . In this study, the expression of p53 in malignant/premalignant lesions and in squamous metaplasia/normal squamous epithelium showed no significant difference. This result is similar to those of the previously published series [32, 33]. Ki-67 antigen is expressed during the cell cycle, with the exception of the G0 phase, and has been used as a marker for proliferation in various tumors, including cervical carcinomas [19, 22]. Kruse et al. concluded that Ki-67 immunoquantitation is a useful diagnostic adjunct to distinguish different CIN grades and may also be a sensitive biological indicator of progression of seemingly low-grade CIN . Lorenzato et al. demonstrate that the most accurate test to distinguish an LSIL from an HSIL was the association of a suspect DNA profile and the presence of Ki-67-positive cells in the upper two thirds of the epithelium . In this study, specimens containing squamous cell carcinoma and premalignant were found to have higher frequency of Ki-67 expression (P<0.05) and more intense and diffuse staining for Ki-67 (P<0.001) (Table 2). Thus Ki-67 is also a specific marker for cervical neoplasia in squamous mucosa. Even though p16INK4a alone widely known to be a specific marker of cervical neoplasia, the relatively high expression of p16INK4a a in squamous metaplasia in this study gives rise to the necessity of the use of other biomarkers or the combination of the markers in some cases. This study observed the absence of full thickness epithelial staining for Ki-67 in spite of the high frequency of p16INK4a staining in squamous metaplasia. In conclusion, although the experience of the pathologist is of substantial importance, the combined use of p16INK4a and Ki-67 immunohistochemistry on the tissue sample preparations is expected to enhance the diagnostic specificity and our ability enormously to distinguish less significant conditions such as squamous metaplasia from premalignant or malignant lesions that may nonetheless give rise to diagnostic ambiguity. 1.Jemal A, Bray F, Center MM, Ferlay J, Ward E, Forman D. Global cancer statistics. CA Cancer J Clin 2011;61(2):69-90. 2.Agoff SN, Lin P, Morihara J, Mao C, Kiviat NB, Koutsky LA. p16INK4a expression correlates with degree of cervical neoplasia: a comparison with Ki-67 expression and detection of high-risk HPV types. Mod Pathol 2003;16(7):665-673. 3.Anttila A, von Karsa L, Aasmaa A, Fender M, Patnick J, Rebolj M, Nicula F, Vass L, Valerianova Z, Voti L, Sauvaget C, Ronco G. Cervical cancer screening policies and coverage in Europe. Eur J Cancer 2009;45:2649-2658. 4.Shin HR, Jung KW, Won YJ, Park JG. 2002 annual report of the Korea Central Cancer Registry: based on registered data from 139 hospitals. Cancer Res Treat 2004;36(2):103-114. 5.Witkiewicz AK, Wright TC, Ferenczy A, Ronnett BM, Kurman RJ. Carcinoma and other tumors of the cervix. In: Kurman RJ, Hedrick Ellenson L, Ronnett BM (eds.). Blaustein's Pathology of the Female Genital Tract. 6th ed. New York: Springer; 2011. p. 253-303. 6.Saslow D, Solomon D, Lawson HW, Killackey M, Kulasingam SL, Cain J, Garcia FA, Moriarty AT, Waxman AG, Wilbur DC, Wentzensen N, Downs LS Jr, Spitzer M, Moscicki AB, Franco EL, Stoler MH, Schiffman M, Castle PE, Myers ER. American Cancer Society, American Society for Colposcopy and Cervical Pathology, and American Society for Clinical Pathology screening guidelines for the prevention and early detection of cervical cancer. Am J Clin Pathol 2012;137(4):516-542. 7.Kim YT, Zhao M. Aberrant cell cycle regulation in cervical carcinoma. Yonsei Med J 2005;46(5):597-613. 8.Lambert AP, Anschau F, Schmitt VM. p16INK4A expression in cervical premalignant and malignant lesions. Exp Mol Pathol 2006;80(2):192-196. 9.Kalof AN, Cooper K. p16INK4a immunoexpression: surrogate marker of high-risk HPV and high-grade cervical intraepithelial neoplasia. Adv Anat Pathol 2006;13(4):190-194. 10.Anschau F, Schmitt VM, Lambert AP, Goncalves MA, Machado DC. Transition of cervical carcinoma in situ to invasive cancer: role of p16 INK4a expression in progression and in recurrence. Exp Mol Pathol 2009;86(1):46-50. 11.Gupta R, Srinivasan R, Nijhawan R, Suri V, Uppal R. Protein p16INK4A expression in cervical intraepithelial neoplasia and invasive squamous cell carcinoma of uterine cervix. Indian J Pathol Microbiol 2010;53(1):7-11. 12.Bergeron C, Ordi J, Schmidt D, Marcus J. Trunk MJ, Keller T, Ridder R. Conjunctive p16INK4a testing significantly increases accuracy in diagnosing high-grade cervical intraepithelial neoplasia. Am J Clin Pathol 2010;133(3):395-406. 13.Galgano MT, Castle PE, Atkins KA, Brix WK, Nassau SR, Stoler MH. Using biomarkers as objective standards in the diagnosis of cervical biopsies. Am J Surg Pathol 2010;34(8):1077-1087. 14.Paulovich AG, Toczyski DP, Hartwell LH. When checkpoints fail. Cell 1997;88:315-321. 15.el-Deiry WS, Tokino T, Velculescu VE, Levy DB, Parsons R, Trent JM, Lin D, Mercer WE, Kinzler KW, Vogelstein B. WAF1, a potential mediator of p53 tumor suppression. Cell 1993;75(4):817-825. 16.Sano T, Oyama T, Kashiwabara K, Fukuda T, Nakajima T. Expression status of p16 protein is associated with human papillomavirus oncogenic potential in cervical and genital lesions. Am J Pathol 1998;153:1741-1748. 17.Gerdes J, Li L, Schlueter C, Duchrow M, Wohlenberg C, Gerlach C, Stahmer I, Kloth S, Brandt E, Flad HD. Immunobiochemical and molecular biologic characterization of the cell proliferation associated nuclear antigen that is defined by monoclonal antibody Ki-67. Am J Pathol 1991;138(4):867-873. 18.Riethdorf L, Riethdorf S, Lee KR, Cviko A, Loning T, Crum CP. Human papillomaviruses, expression of p16, and early endocervical glandular neoplasia. Hum Pathol 2002;33(9):899-904. 19.Cabibi D, Giovannelli L, Martorana A,Migliore MC, Tripodo C, Campione M, Ammatuna P, Aragona F. Predictive role of histological features and Ki67 pattern on high-risk HPV presence in atypical cervical lesions. Histopathology 2007;51:713-716. 20.Kruse AJ, Baak JP, de Bruin PC, Jiwa M, Snijders WP, Boodt PJ, Fons G, Houben PW, The HS. Ki-67 immunoquantitation in cervical intraepithelial neoplasia (CIN): a sensitive marker for grading. J Pathol 2001;193:48-54. 21.Kruse AJ, Baak JP, Helliesen T, Kjellevold KH, Bol MG, Janssen EA. Evaluation of MIB-1-positive cell clusters as a diagnostic marker for cervical intraepithelial neoplasia. Am J Surg Pathol 2002;26:1501-1507. 22.Kruse AJ, Baak JP, Janssen EA, Kjellevold KH, Fiane B, Lovslett K, Bergh J, Robboy S. Ki67 predicts progression in early CIN: validation of a multivariate progression risk model. Cell Oncol 2004;26:13-20. 23.Keating JT, Cviko A, Riethdorf S, Riethdorf L, Quade BJ, Sun D, Duensing S, Sheets EE, Munger K, Crum CP. Ki-67, cyclin E, and p16INK4 are complimentary surrogate biomarkers for human papilloma virus-related cervical neoplasia. Am J Surg Pathol 2001;25:884-891. 24.Lorenzato M, Caudroy S, Bronner C, Evrard G, Simon M, Durlach A, Birembaut P, Clavel C. Cell cycle and/or proliferation markers: what is the best method to discriminate cervical high-grade lesions?. Hum Pathol 2005;36:1101-1107. 25.Edge SB, Byrd DR, Compton CC, Fritz AG, Greene FL, Trotti A. American Joint Committee on Cancer Staging Manual. 7th ed. New York: Springer; 2010. 26.Sinicrope FA, Ruan SB, Cleary KB, Stephens LC, Lee JJ, Levin B. bcl-2 and p53 oncoprotein expression during colorectal tumorigenesis. Cancer Res 1995;55:237-241. 27.Tringler B, Gup CJ, Singh M, Groshong S, Shroyer AL, Heinz DE, Shroyer KR. Evaluation of p16INK4a and pRb expression in cervical squamous and glandular neoplasia. Hum Pathol 2004;35(6):689-696. 28.Nam EJ, Kim JW, Kim SW, Kim YT, Kim JH, Yoon BS, Cho NH, Kim S. The expressions of the Rb pathway in cervical intraepithelial neoplasia; predictive and prognostic significance. Gynecol Oncol 2007;104(1):207-211. 29.Thomas M, Pim D, Banks L. The role of the E6-p53 interaction in the molecular pathogenesis of HPV. Oncogene 1999;18:7690-7700. 30.Huibregtse JM, Scheffner M, Howley PM. A cellular protein mediates association of p53 with the E6 oncoprotein of human papillomavirus types 16 or 18. EMBO J 1991;10:4129-4135. 31.Marks JR, Davidoff AM, Kerns BJ. Overexpression and mutation of p53 in epithelial ovarian cancer. Cancer Res 1991;51:2979-2984. 32.Kohlberger P, Edwards L, Hacker NF. Microinvasive squamous cell carcinoma of the cervix: immunohistochemically detected prognostic factors in a case with poor clinical outcome. Gynecol Oncol 2003;90(2):443-445. 33.Graflund M, Sorbe B, Karlsson M. Immunohistochemical expression of p53, bcl-2, and p21(WAF1/CIP1) in early cervical carcinoma: correlation with clinical outcome. Int J Gynecol Cancer 2002;12(3):290-298.